Towards a Healthier and Brighter Future! The Konica Minolta Group (hereinafter, “Konica Minolta”) is continuing to support the Pink Ribbon Campaign for raising breast cancer awareness. Various activities are being carried out this year, as well, with the goal of promoting the early detection, diagnosis, and treatment of breast cancer by informing as many people as possible about the importance of breast cancer screening. The pink ribbon symbolizes the need for early detection, diagnosis, and treatment of breast cancer. Timed with Breast Cancer Awareness Month, various activities are carried out across Japan every October. Described below are some of the activities being promoted by Konica Minolta with the aim of fostering breast cancer awareness among both women and men. Konica Minolta is putting on a special exhibit entitled, Pink Ribbon Nail Art, at the Konica Minolta Plaza in Tokyo, a gallery space run by the company as a venue for communication with its customers, with the desire to contribute to society, culture, and art. Held from October 1 to 10, 2008, the event is expected to help convey the importance of breast cancer screening to many people. For this special exhibit, famous personalities in Japan who have survived breast cancer were asked to design their own nail art, a form of expression that symbolizes the beauty of women and their fashion. These works, designed out of a desire to support the Pink Ribbon Campaign and with the hope of promoting breast cancer screening, will be rendered as sample nails and photographic panels of nail art, and displayed along with the original designs and messages from the creators. The exhibit space will also feature instructional panels on breast self-exams, and sample mammography images, as well. There will also be a talk show involving well-known breast-cancer survivors as a special event on the weekend during the exhibit. The redesigned Pink Ribbon Website,* which is accessible from the Konica Minolta Website, was launched this autumn. It is now easier to use, and it offers a lot of useful information. The new Pink Ribbon Website tells women about the importance of early detection and diagnosis of breast cancer, by explaining breast cancer basics, self-exam methods, and breast cancer screening, while providing a plethora of other information. * Only available in Japanese. 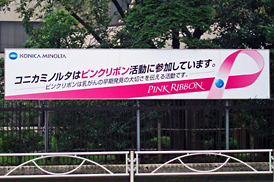 To mark Breast Cancer Awareness Month, the Konica Minolta Tokyo Site has set up a billboard to show the company's support for the Pink Ribbon Campaign, conveying the importance of early breast cancer detection to everyone in the community. Konica Minolta will continue to support the Pink Ribbon Campaign, with the hope that everyone can enjoy a healthier and brighter future.